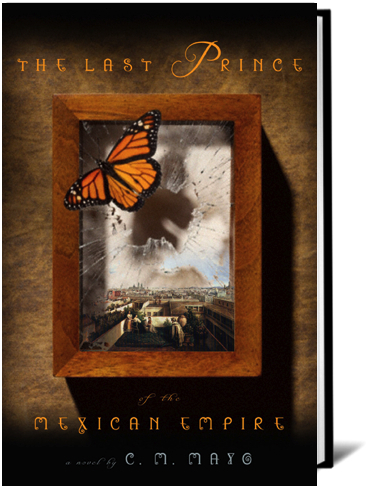 My novel is based on the true, strange, and heart-breaking story of, as the title says, The Last Prince of the Mexican Empire. If youve never heard of Mexicos little half-American prince, not to worry: even many beautifully educated Mexicans have not. Mexicos 19th-century history is, to make an understatement, labyrinthically labyrinthical. (I like to say, if youve heard of Santa Anna and you know that Cinco de Mayo is not Mexicos Independence Day, youre doing OK.) Many Mexicans would prefer not to dwell on the Second Empire of Maximilian, a period also known as the French Intervention. Royalty, foreign invasion: not an appetizing combination for many. Furthermore, when I came upon the story of Mexicos last prince, and began to read more deeply, I soon realized that the little that had been published about him was riddled with errors and a mystifying vagueness. And so began my plunge into nearly a decade of research in archives from Mexico to Vienna to Texas and Washington, D.C. When, in a Barnes and Noble in Bethesda, Maryland, I read the scene where the princes mother attends the ball in Mexico Citys Imperial Palace, one of the members of the audience put on such a wide-eyed expression, I almost stopped reading. Afterwards, with great emotion, she told me that when she was little, she had played with her great-great-great-grandmothers ball gownshe had been told it had been worn at Maximilians ball in the Imperial Palace. Perhaps that very same ball. From Guanajuato, Mexico, a reader wrote to me about Maximilians crystal flutea rare German flute still being played today, by an acquaintance, member of the symphony orchestra in that city. After a book group luncheon in Austin, a Mexican lady showed me a slender bracelet that had belonged to the Empress Carlota. It was black and gold, as elegantly severe as Carlota herself. Its small heart-shaped black locket with a gold cross had been Carlotas mothers. The clasp was broken. There the little locket lay, shining in the Texas afternoon, on the open palm of her hand. Here in 2010, as were facebooking and tweeting and skyping, wearing jeans and T-shirts, spooning up microwaved whatnots as we watch news of, say, President Obama or President Calderon, it might seem the world of crinolines and kings (and I mean the kind that actually wielded some power, not just provided fodder for People magazine) has nothing, not a thing, to do with our world. But these anecdotes, these relicsa gown, a bracelet, a fluteremind that, perhaps, however blindly, we are all more closely connected to this time than we realize. Near Washington DC, a reader with a German name told me that her ancestor, inspired by Maximilian, had immigrated to Mexico during the Second Empire, to farm in Yucatan. Things didnt work out; he soon made his way to Ohio. Who would have guessed? But we can find vivid connections to the past in more ways than these. Heres a mind-stretcher of an exercise: imagine that from your birthday, time runs backwardswhere do you end up? I was born in 1961, which makes me 49. Forty-nine years into the past would take us to the year 1912. In that year, the prince, Agustin de Iturbide y Green, only a toddler when the Emperor Maximilian took him into his Court, is now my same age! (Living in Washington, D.C., and teaching French and Spanish at Georgetown, by the way.) Mexico, lately ruled by the iron fist of Porfirio Diaz, a general who fought against Maximilian, has just begun to convulse in what will be a decade of Revolution. The Empress Carlota is still alive, too, mad as a mushroom, locked away in a castle in Belgium. Had Maximilian survived, he would have been 80 years old. (Imagine the splendid copper-red beard grown out as white as Santa Clauss.) Maximilians older brother, Franz Joseph, is still Kaiser of the Austro-Hungarian Empire World War I has yet to shatter. It all seems so long ago and yet, it is a heartbeat away.